I thought about these plates for a week and decided to go back to Home Goods and get them. Love them! I love to sew and bought this at an antiques mall in Arkansas. Story behind Raggedy Andy is-when I was 6 years old I already had had my Raggedy Anne doll for 2 years and she was my favorite. I slept with her every night. So of course I wanted Andy for Christmas. I saw the wrapped box under the tree and shook it and just knew that was it. Christmas morning I go to open that box and there were a pair of slippers! Oh my-disappointment. A few presents later there was the much awaited Andy Doll in a different size box. So there he is. 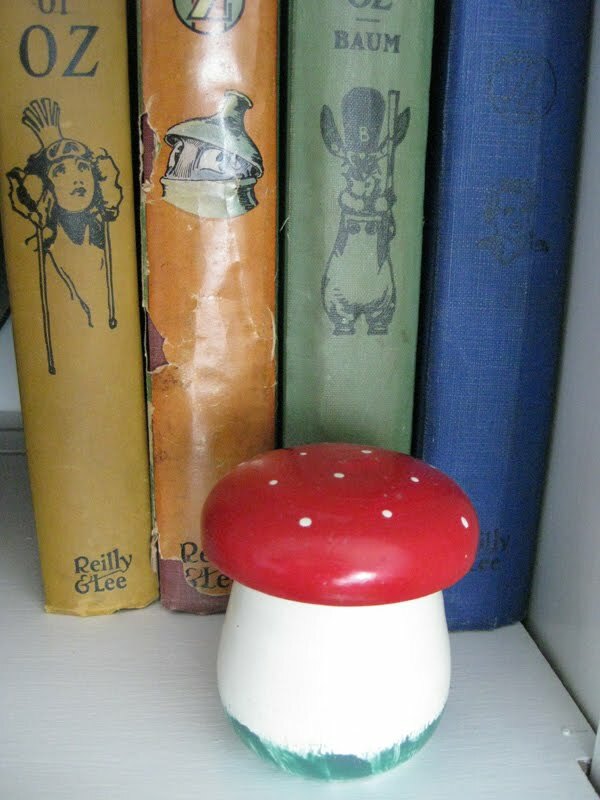 Little Tiddly Winks game in mushroom- what a cute game" box". Thanks you Sue at It's a Very Cherry World for hosting this party. Go check out everyone elses red and have a great Rednesday! Ooh, what wonderful reds you have today! I too saw those plates, and am making a trip back to the city next week. Your picture is so inspiring that I'll be making a stop at Home Goods! Keep your fingers crossed that they are still on the shelf. I posted a picture of a couple of red and white polka dot mushrooms as part of my Rednesday post, too. What a coincidence! Ohhhhh, I am in love with that sewing machine... love the plates too. I love visiting with you. You have such charming things and such a great eye! I'm suffering from serious envy and I Wanna's over your sewing machine - how cute is that?! Is it a kitchen towel beneath the adorable polka dot plate? It's so darling. 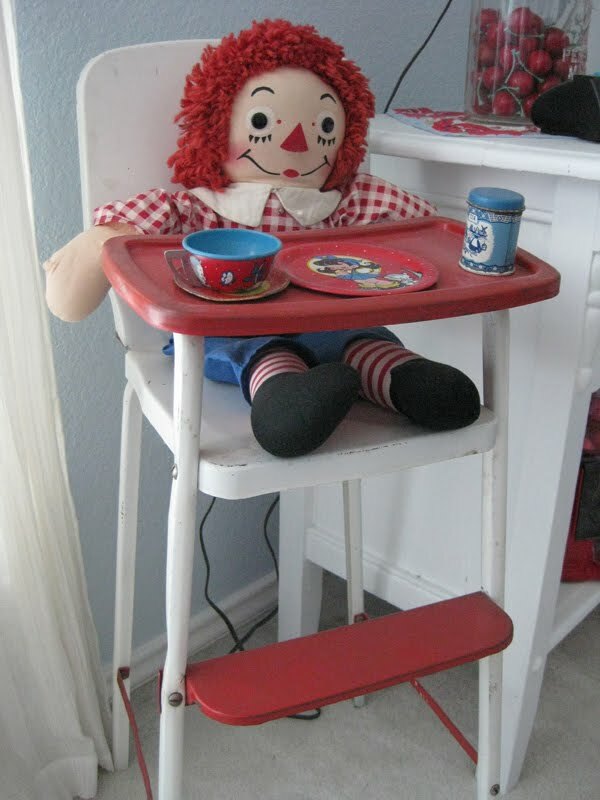 And Andy and his high chair and his dishes too, you're killing me here. Thank you for all the smiles. Happy Rednesday! Wow! You have tons of great vintage treasures! I love it all. You're right, our kitchens are very similar. To be honest, I wish I hadn't gone with hardwood in there, it's a biatch to keep clean! I wish there was a Home Goods near me, because I love those plates! That's so neat that you still have your Raggedy Ann and Andy, and that sewing machine is so sweet. I had one like that when I was a little girl, and I just recently asked my Mom where it is, and sadly she doesn't know what happened to it. One more thing to look for on Ebay, as I buy back my childhood one thing at a time! Raggedy Ann doll when we were dating in college. 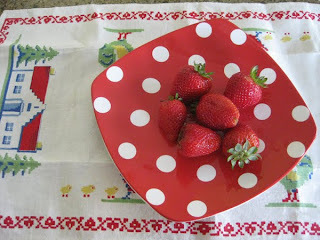 I love all the reds today.Mmmmmm Home Goods trip when I come to visit you..none down here in San Antonio area. 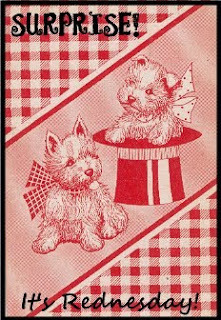 Pink Gingham story has been posted today!! I've never heard of Home Goods!! Must seek one out! 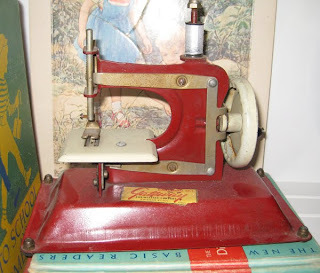 That sewing machine is spectacular too-- but you know I really like those vintage Oz books. The book I thought was the Child's Garden of Verses is actually a Robert Louis Stevenson Reader-- I'm still going to blog about it and link back to your post. Thanks for visiting both of my blogs. Leslie..hey girl..I was fixing to mail Miss Pink Gingham out and I need your address and your e-mail address. Post it as an email to me!! I think everything is working now!! Nuts! I can't decide which one I like best - I guess I'll choose the mushroom! Those Garden of Verse books are a great item to collect - there are so many different covers - how fun! 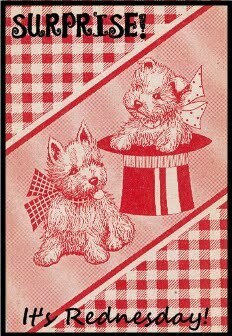 Tiddly winks--used to soooo love that game as a child. It is a cute game box you have shown! Your doll seems to be in great shape! What fantastic reds you have shared with us today!! That sweet sewing machine is making my heart go pitter patter! !